As already remarked upon with regard to Australia, it was impossible for Madame Anna A. Guérin to visit New Zealand in pursuit of personally achieving her ‘Inter-Allied Poppy Day’ scheme within all Allied countries. Madame Anna A. Guérin’s representative, Colonel Samuel Alexander Moffat, arrived in Auckland, New Zealand at 7a.m. on 27 August 1921, from Vancouver, Canada. He sailed into port on the ship ‘Makura’. It appears that Colonel Moffat arrived in Sydney, Australia on 13 September – he may have left Wellington, New Zealand around the 6th (?). Before he left, he must have attended a meeting of the Standing Sub-Committee of the Dominion Executive of the Returned Services’ Association in Wellington. It is believed that Colonel Moffat did make it back in time to attend that meeting. He was probably only in Australia a week before he returned to New Zealand, possibly departing Sydney around 20 September. He may have arrived in Wellington on 25 September (?) in order to attend another Returned Services’ Association Dominion Executive meeting on the 26th, in Wellington – prior to the Executive making its decision later in the day. (There are a lot of question marks and guesses relating to this period of time, so any enlightenment or correction will be welcomed). On the 26 September, the Dominion Executive of Returned Services’ Association of New Zealand officially passed a motion and adopted the poppy. My mission to New Zealand and Australia at this time is to extend a cordial invitation to the Returned Soldiers’ Association to join in wearing the poppy on November 11 this year. On 01 October, Colonel Moffat departed the Port of Auckland to visit Australia again – he was sailing on the ship ‘Riverina’. He went to be in Australia for Armistice Day. The Ashburton Guardian (of Canterbury, Christchurch) printed this article on Armistice Day 1921: “ARMISTICE DAY. CIVILIZATION’S DEBT. THE WAR’S OBJECT LESSON. OBSERVANCE IN ASHBURTON. When the story of the Great War is told to our children’s children by the war-wise men and women whose suffering has ceased and whose anguish is over – they will surely hear of how liberty was saved and tyranny overthrown by the silent working of the law which is inexorable, inevitable, and irresistible. This is the test of our faith, the real index of our inspiration – that Providence watches over men and leads them through the gloom of war to the light of happier years. Ghastly as war is there are ghastlier things bitter as its pain, heavy as its burden, there are pains more bitter and burdens more heavy. Would any free man who has given his life for his country have saved his life by becoming slave and vassal? Would any war broken soldier take health and strength on the Prussian terms? The qualities that we remember today, on the third anniversary of the armistice between the Allied Powers and Germany, are the qualities of courage and self-sacrifice, exemplified: by New Zealand’s soldier sons, those who gave their lives and of their physical manhood that freedom, liberty and justice might not vanish from off the earth. Righteous war with its appeal to all that is highest and noblest in the human heart, with its inexorable demand for self-sacrifice, with its stern teaching that the worthy man must offer his life if Humanity is to save its soul, leaves a harvest of moral teaching. In a little while all our sufferings will be forgotten, and only the heroic memory will endure. Honoured forever, immortalised by a grateful world, enhaloed by a redeemed civilisation will be those who bore the burden and stood to their duty and gave their life’s blood to the service of mankind. Against the German object-lesson will stand a greater and a nobler teaching – of how millions died and tens of millions suffered so that Peace should have its victory and Democracy should not perish. Thus in Ashburton to-day we remembered the sacrifice of our manhood and how the burden was lifted at the signing of the armistice at the eleventh hour of the eleventh day of the eleventh month of the year 1918. The silence which came that day three years ago in the trenches and the muddy battlefields of France has become a symbol associated with the observance of Armistice Day. At 11 a.m. all work, all movement, ceased for two minutes, and a quiet hush fell over the town. The thoughts of most were somewhere away overseas, straying amid the French fields of scarlet poppies, or lingering on a sandy beach lapped by the blue Mediterranean. Beautiful is the sentiment of remembrance; grand is the thoughtful moment wherein we recall those who went hence for the honour of their country. The observance of Armistice Day in Ashburton was simple, but wonderfully expressive. WELLINGTON, This Day. The House met at 10.55 a.m. At 11 o’clock members rose, and standing in their places, observed silence for two minutes m commemoration of the signing of the armistice. At the termination of this period the hymn, “O God Our Help,” was sung by members and the public who crowded the galleries. The ceremony terminated with a verse of the National Anthem. The House then rose till 2.30 in the afternoon. CHRISTCHURCH, This Day. Armistice Day was observed with fitting solemnity at the Cathedral. Viscount Jellicoe and staff attended. All movement was stopped, and a two minutes’ silence was observed. DUNEDIN, This Day. Armistice was observed by a two minutes’ silence. The “Last Post” was sounded at the Town Hall. Newspapers were printed with news of the day’s commemorations elsewhere in the world, mainly in London. “LONDON, November 13. “Despite bitterly cold weather, 2000 people witnessed the unveiling of the memorial to the 97 Australians and one New Zealander buried at Harefield, in Middlesex. The vicar of Harefield, assisted by the Rev. Harrington Lees, conducted the dedication service, after which Sir J. D. Connolly (Agent- General for West Australia) unveiled the monument. Having stayed in Australia for the 11 November preparations there and for the day itself, Colonel Moffat arrived back in New Zealand on 15 November 1921. He had sailed out of Sydney on the ship ‘Makura’ and into Auckland. Colonel Moffat left Wellington, New Zealand and arrived in Sydney on 13 December. He sailed out of Melbourne, Australia for England on 31 December 1921. One “Samuel A. Moffat” arrived in Liverpool on 20 February 1922, on the ship ‘Aeneas’, “in transit [to] France”. This gentleman had given his occupation as “Publicity Agent” and was aged “44” – all facts point to this being our Colonel Moffat. He would have felt happy and confident that he had been a successful ambassador for Madame Anna Guérin and La Ligue. Thirteen days later, Melbourne’s Evening Post (13 Feb.) printed a ‘Customs Duty Refunds’ list on goods entering the country and the French-made poppies featured in this list: “…; Flanders poppies to be sold for the benefit of wounded soldiers in New Zealand, £376; …”. The Customs Refund for the year ending 31 March 1923: A refund for poppies is not listed. The Customs Refund for the year ending 31 March 1926: A refund for poppies is not listed. The Customs Refund for the year ending 31 March 1929: Page 148, Item 37: “Artificial poppies to be sold for the benefit of returned New Zealand soldiers” – £215. “A refund of £215 is to be made by the Customs Department in respect of the duty on artificial poppies imported by the R.S.A. 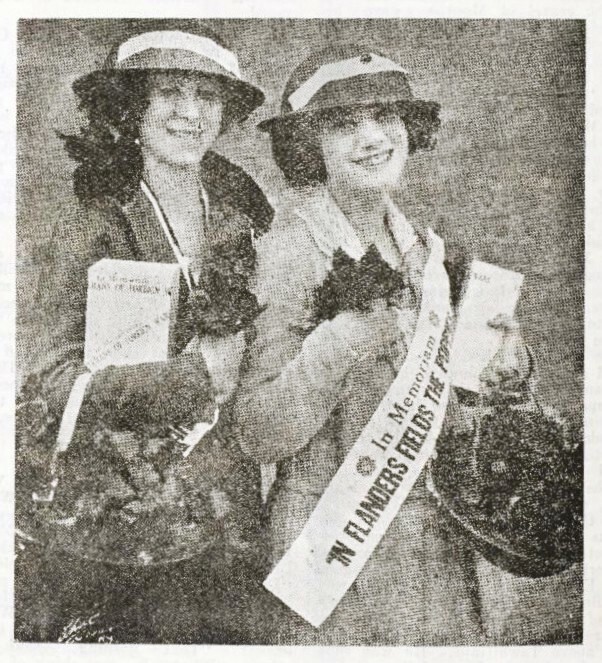 for Poppy Day sales.” (Auckland Star, Volume LIX, Issue 186, 8 August 1928, Page 12). It is often reported that the ship carrying Madame Guérin’s poppies arrived in New Zealand “too late” for the scheme to be properly promoted before Armistice Day/11 November 1921 and, as such, it was decided to postpone the remembrance poppy ‘event’ until close to the New Zealand Anzac Day commemoration on 25 April 1922. Logically, that would suggest an arrival of poppies with the 11 November 1921 imminent. However, could the aforementioned telegram of 31 January 1922 (and subsequent Customs refund 13 days later) suggest the poppy cargo arriving in January 1922? If this was the reality, when it came to choosing “Armistice or Anzac Day”, could it be that the R.S.A. had made a conscious decision to choose Anzac Day instead of Armistice Day anyway? As already quoted, either had been an option initially. Of course, the fact that the New Zealand Returned Soldiers’ Association did not officially adopt Madame Guérin’s ‘Inter-Allied Poppy Day’ idea until 26 September 1921 would not have helped the country’s place in the poppy-ordering timeline – other Empire countries had a head-start on it. One visitor to the Owairaka School was a lady who addressed all the classes there. She had been a representative of Poppy Lady Madame Guérin’s French charity in New Zealand and, it seems, had remained loyal (perhaps like many women across the country) to Madame Guérin’s poppy drives. Long after New Zealand had said “au revoir” to Madame Guérin after the 1928 poppy campaign, this woman was still loyal enough to be speaking of Madame’s achievements. As in all countries that adopted Madame Guérin’s ‘Inter-Allied Poppy Day’, women were in the majority on the Poppy Day committees that had to be established to make all the arrangements for the poppy distribution – a distribution by women, with some veterans. This gentleman vividly remembers the lady speaking about Madame Guérin. The lady spoke about the poppies and stated, disappointingly, “… we couldn’t get them to your country on time”. Additionally, around the same time as the lady’s visit, a 70 year old historian came. He had been a professor of the class teacher, Mr. Carter. The professor had been wounded in Flanders and was 29 when World War One ended. Addressing only Mr. Carter’s class, the professor vividly told the pupils about the late arriving Poppy ship and described how he had been a poppy seller in April 1922. He said the poppy campaign had “caused some confusion and the Returned Soldiers’ Association really had to market hard to get people to buy the poppies that April. After that, the R.S.A. announced it would continue to sell the poppies in April despite what other countries did (including Australia) and despite what the Guérin organisation wanted”. The view of this New Zealand gentleman is, with New Zealand being quite isolated at that particular time, Colonel Moffat doubted if the shipment of poppies could make it before Armistice Day, so the Returned Soldiers’ Association decided that it was more suitable to choose Anzac Day 1922. As a footnote: whilst carrying out research in later life, this gentleman saw a note from a commemoration organiser in Invercargill – it related to the choice of poem for Armistice Day 1921. The poem was “to change as there weren’t going to be any of the hoped for Poppies”. Perhaps the poem was originally going to be John McCrae’s ‘In Flanders Fields’ … “In Flanders fields the poppies blow …”? The aforementioned New Zealand gentleman, of Christchurch, recalls once seeing (a long time ago) the name of the ship that brought the cargo of poppies to New Zealand. When asked if ‘Westmoreland’ rang a bell, this gentleman replied “The name of the ship I saw mentioned resembled a place name around here. We have a suburb here in Christchurch called Westmorland. It [the name] had several syllables I do remember”. Madame Guérin may have negotiated a similar travel deal to that arranged for the cargo of Newfoundland poppies (and other Empire countries also, for that matter?) … a sea voyage from France to a south coast port in England plus a train journey to the port of Liverpool – ahead of loading on the assigned ship, for its final destination (?). Any further facts about the New Zealand poppy shipment would be welcomed. The Press (Christchurch, NZ: 11 February), detailed a meeting at the Social Hall of the R.S.A. Club on 07 February 1922 of the Womens’ National Reserve Committee. A Mrs W. Wood presided and she gave details ‘Poppy Day’ in Christchurch. “The sale day will be fixed as close as possible to Anzac Day, so that everyone will have the opportunity of wearing a poppy on that day. … One quarter of the money to be returned to the makers of the poppies in France, the balance to remain in Christchurch for the up-keep of the lonely soldiers’ graves. All present promised their support. It was decided it would be necessary to hold a two days’ sale this year, (the dates being approximately the 19th and 21st of April. Mrs Wood also stated that members of the R.S.A. were willing to give their services towards the cause.” Thus the New Zealand women were starting to get organised, just as their Allied counterparts had. On 20 February 1922, The Evening Post (Wellington) promoted the country’s Poppy Day: “FLANDERS POPPIES. POPPIES SALE ON ANZAC DAY. PROCEEDS TO RELIEVE UNEMPLOYED. Replicas of the Flanders poppy will be sold throughout the Dominion by the New Zealand Returned Soldiers’ Association on Anzac Day. The net proceeds will be used for the relief of unemployed returned soldiers. The scheme placed before the Dominion executive of the association at its meeting on Sunday provides that poppies shall be distributed to the districts in proportion to population. The district secretaries will allocate the poppies to the various towns. Wellington City will get 122,100. The large poppies will be sold to the 300 largest schools in the Dominion for school wreaths to be placed on monuments. Twelve poppies will be required to make a wreath, and the charge will be 2s each, or 24s for the wreath. The small poppies are to be sold at Is each. The gross proceeds, if all the poppies are sold, will be over £20,000. The standing sub-committee recommended that the money derived from the Poppy Day effort, after paying all expenses, should be devoted to soldier unemployment relief during the coming winter. Already there are indications that many of our comrades will have a struggle to exist during the winter,” said the sub-committee, and it is imperative that some scheme should be prepared to cope with hardship among soldiers. The net amount of money gathered in a district would be spent on unemployment relief in that district. The N.Z.R.S.A. would work in conjunction with the Public Works Department and local bodies in all cases, and the allocation of funds in a district would be determined by the N.Z.R.S.A. after consultation with the local associations, the Department, or the local bodies. (d) Single- men without dependents. The article documents that, six weeks previous, sixty-three Returned Soldiers’ Association branches had been sent a circular letter by the general secretary. They were each encouraged to be “the most energetic”; to “show the best results”; and “take the most pains to get the help of all willing works” … basically, the branches were set the challenge to be the most successful … to “show the best results, proportionately to population of the districts worked”. The R.S.A. had also been in contact with 240 towns/townships that had no Association branch, to the same end. 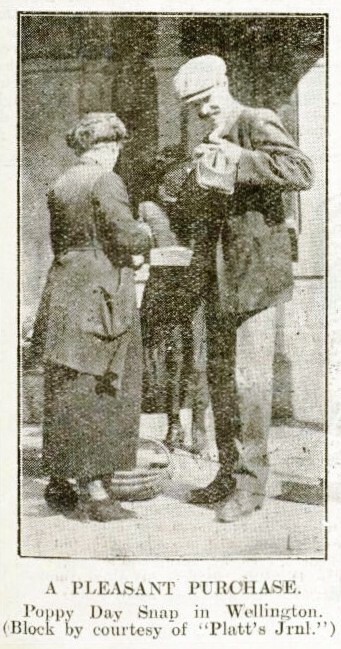 On 15 April 1922, New Zealand’s ‘Auckland Star’ newspaper printed this piece: “Madame Guerin, “poppy lady of France”‘ and director of the French Children’s League, has cabled to the general secretary of the New Zealand Returned Soldiers’ Association, stating that she is forwarding him six French flags to be awarded to the six towns selling the most poppies during the poppy campaign.” Many other newspapers carried the same paragraph. Are free from cankering care. Broken and worn in the wax. From information received from headquarters, N.Z.R.S.A., Poppy Day will be a huge success throughout the dominion. Complete preparations have been made in every city, town, village, and hamlet to ensure the success which the venture deserves. Without any doubt it is the biggest philanthropic social undertaking ever put before the public by the Returned Soldiers’ Association for the benefit of returned soldiers, and the objects to which the money raised be devoted must commend themselves to the public. About a quarter of the money raised will be remitted to Paris, where a committee will disburse it among the, widows and children who made the poppies. The remainder will be solely devoted to the relief of unemployment among soldiers. There are at present between 1000 and 1200 unemployed ex-soldiers throughout New Zealand and the N.Z.R.S.A. has decided to obtain work for these men and thus relieve general unemployment. It should be carefully noted that with the exception of overhead expenses the R.S.A. will not retain one penny of the money raised; the amount gathered in a district will be spent upon work in that district. Other newspapers printed the same above-transcribed article but the ‘NZ Truth’ (22 April) headed up the poem “THE PEBBLED SHORE OF MEMORY”. A Message From The Dead.”. [“ … along the pebbled shore of memory … “ is a quote from the Keats poem ‘Endymion’]. On 22 April 1922, the Hawera & Normanby Star wrote: “From information received from headquarters, N.Z.R.S.A., Poppy Day, Monday, April 24, will be a huge success throughout the Dominion. Complete preparations have been made in every city, town, village, and hamlet to ensure the success which the venture deserves. … … About a quarter of the money raised will be remitted to Paris, where a committee will disburse it among the widows and children who made the poppies. The remainder will be solely devoted to the relief of unemployment among New Zealand ex-soldiers.” Unemployment was a big problem within all the Allied countries after WW1 ended. … and so … 24 April 1922 dawned, New Zealand’s first Poppy Day – on the eve of Anzac Day. Preparations had been made in every city, town and village in the country and success was expected. “POPPY DAYS. A BRILLIANT SUCCESS. New Zealand held out a collective hand for the bright red Poppies of Remembrance which the N.Z.R.S.A. offered in aid of unemployed soldiers and their dependants. There were not enough of the large poppies (14,000) to meet the demands of schools and other institutions, and there were not enough of the buttonhole emblems, though the supply was nearly 300,000. Ladies’ committees throughout New Zealand rallied enthusiastically to the call of the R.S.A., and the result was a sale which will live long in the people’s memory. The sales were similarly speedy in all parts of New Zealand. Telegrams poured into the general secretary of the N.Z.R.S.A. requesting the quick despatch of more poppies, but he had no more to send. Thus, in great warmth of heart the people testified that they wished to help their defenders, the active service men of the war who now desire active service in the tasks of peace. Where so many people helped gladly in a worthy cause, it is not possible for the N.Z.R.S.A. to thank these active friends individually, but all can accept the heartfelt assurance of the R.S.A. that it is grateful for this kindly remembrance of comrades to whom unemployment has brought anxiety and suffering. The takings in Wellington city were £1427, and the amount for the city and its environs was £1723. It is anticipated that the total for New Zealand will reach the figures for which the N.Z.R.S.A. strove (a sum between £10,000 and £12,000), but full details have not yet reached Headquarters. Immediately after the receipt of this information, a complete statement will be published in the daily press. 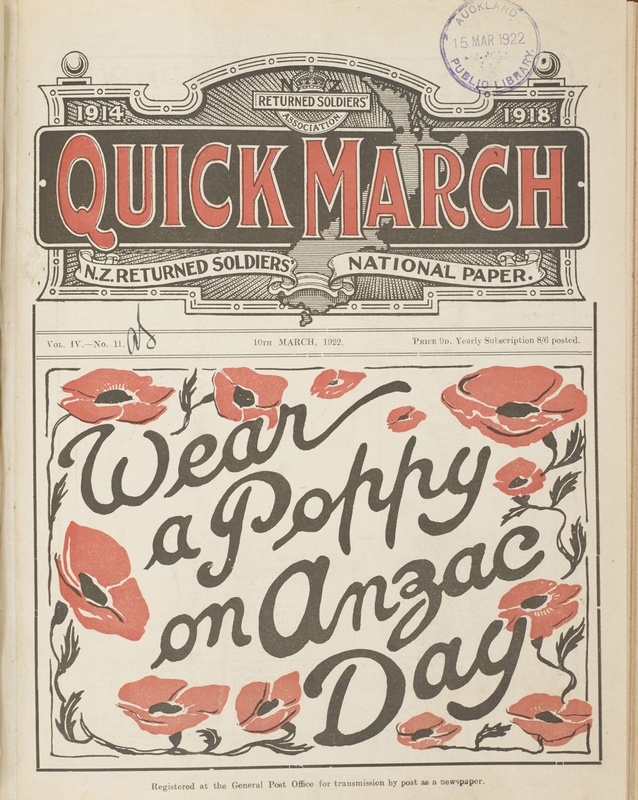 In a later NZ Returned Soldiers’ National Paper ‘Quick March’ (10 April 1923), the “Sniper” recalled this first poppy campaign. The “Sniper” remembered the first Flanders’ poppies he had seen: “the Battalion to which I was attached had just taken over its first sector of trenches at Houplines, a suburb of Armentieres. Those who were in this sector will remember the sinuous C.T. threading its way through the beautiful orchard en route to the front line. This orchard was dotted all over with beautiful red poppies, and so were some “Tommy” graves in the orchard; it was also well pitted with shell holes. I thought at the time that this flower was quite typical of a soldier’s life; to-day red and full of life, to-morrow a thing of the past, destroyed by War’s deadly blast. “Sniper” stated that “in every hamlet, town, and city” there had been insufficient supply of the beautiful large poppies in 1922. For 1923, 250,000 small poppies and 30,000 large ones were ordered and each district had received these several months ago. “POPPY LADY OF FRANCE. HIGH PRAISE FOR NEW ZEALAND. “WREATHS FOR FLANDERS GRAVES. The Poppy Lady of France, for such is the official title of the organiser of the Poppy Day movement, has written to the New Zealand Returned Soldiers’ Association offering her thanks to them and to the people of New Zealand for the success achieved on Poppy Day. “Allow me to thank you,” she writes, “for all your amiability to Colonel Moffatt, my representative, who had the great chance to come first in your beautiful country. We thought that probably a letter from your organisation would have given us some details of the most wonderful ways the campaign was handled, so that so many flowers were disposed of in such a small country; and then, also, I have been travelling in the countries of our European allies, in view of their Poppy Day on Armistice Day, so I pray you all to excuse the delay of my letter, and to accept the expression of our deep gratitude. “In using those, and so many of those, Flanders poppies, you helped so many poor widows and orphans of those battlefields, where your gallant men came to die at the sides of our French poilus (soldiers) for France and for humanity. I am proud to say that, proportionately, you are the country that did obtain the best result for the first year of Poppy Day. “For this second year everyone is hoping great results. England and Scotland are hoping to sell fifteen million poppies, France a good portion of it, little Belgium also, and to make by this simple and magnificent way to honour the dead enough money to help during the coming winter all those ex-soldiers who are still in distress. “We have sent to your great neighbour, Australia, the supply of poppies and wreaths necessary with the balance they had left from last year to have great success on November 11. “I was hoping to be able to sail at the end of this month for Australia and New Zealand. It would have been a great pleasure to me to give some lectures in all your schools or posts, but I see now I must postpone this pleasure. So, not being able to bring them myself, I am sending you six military fanions, or flags. Please give them to your posts, or to your schools or clubs which have helped the most during the Poppy Day, as a little token of our remembrance and our gratitude. It has not been necessary to send’ them nailed to their staffs, so we are sending everything necessary to have them nailed as they ought to have been. Allow me to thank you again for your great courtesy to Colonel Moffatt to tell again to your people how happy we are to feel that once a year the flowers of France will flourish on every breast in the far-away but dear land of New Zealand, and to send for you and for all the members of your organisation the expression of our grateful and most sincere sentiments. “The writer, who is Madame Guerin, of Paris, acknowledged having received the amount forwarded for the purchase of the poppies sent. 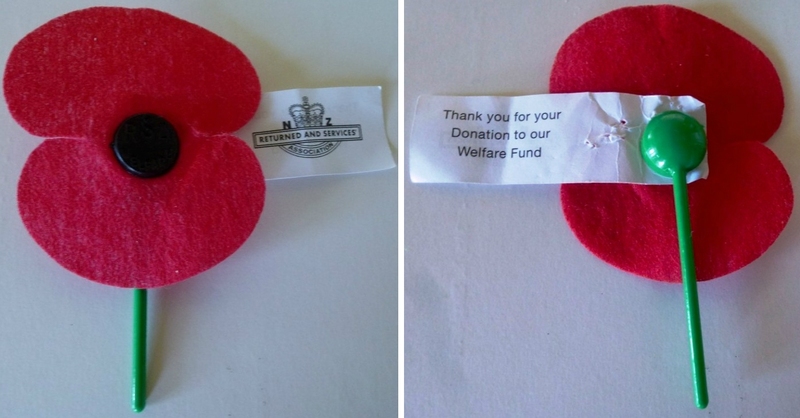 New Zealand ‘Returned & Services Association’ Remembrance Poppy. Image courtesy/© of A.&P.H. The New Zealand Passchendaele Society’s poppy emblem. Courtesy of Gavin Marriott. The New Zealand Passchendaele Society was created to make future generations aware of the courage and sacrifice of New Zealanders at Passchendaele in Flanders and the Western Front during the First World War. Mindful of the quest to dispel myths in these chapters relating to Poppy Lady Madame Guérin, this author is keen to share information discovered after being enlightened by a New Zealander – about this organisation called The Passchendaele Society. The uneducated could be forgiven for believing that New Zealand’s one and only part played in the Great War was during the Gallipoli campaign – such are the inferences abound but the country’s participation goes far beyond the highly publicised ANZAC commemorations. At the time of the Gallipoli campaign, it would appear that neither the Australian nor the New Zealand forces were known as serving officially under an ‘ANZAC’ title … the only ‘ANZAC’ unit, on record, was a mounted unit in the Sinai. Nor, on 25 April 1915, did the New Zealanders land at dawn at Gallipoli, like the Australians … the landing the New Zealanders made was with the 2nd Australian division later on that day. Both the New Zealanders and Australians landed on the other side of the Turkish peninsula: referred to as the landing at Gaba Tepe (now known as Anzac Cove). The losses New Zealand’s suffered during this campaign were small compared with that of Turkey and Australia (small but, obviously, not insignificant) … and small in comparison to the New Zealanders lost on the battlefields of Belgium (including Passchendaele) and France. The Commonwealth War Graves Commission has listed responsibility for 18,063 New Zealanders who fought in World War One – including 4633 in Belgium; 7780 in France; 2347 in Turkey (including Gallipoli). An aim of The Passchendaele Society (Inc) is “to ensure New Zealand’s darkest day is not forgotten”. As Belgium has never forgotten, the Society’s raison d’etre is to enlighten: in order that New Zealand does not forget either. 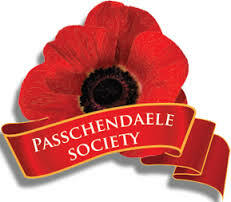 Discover more on The Passchendaele Society website http://passchendaelesociety.org/. 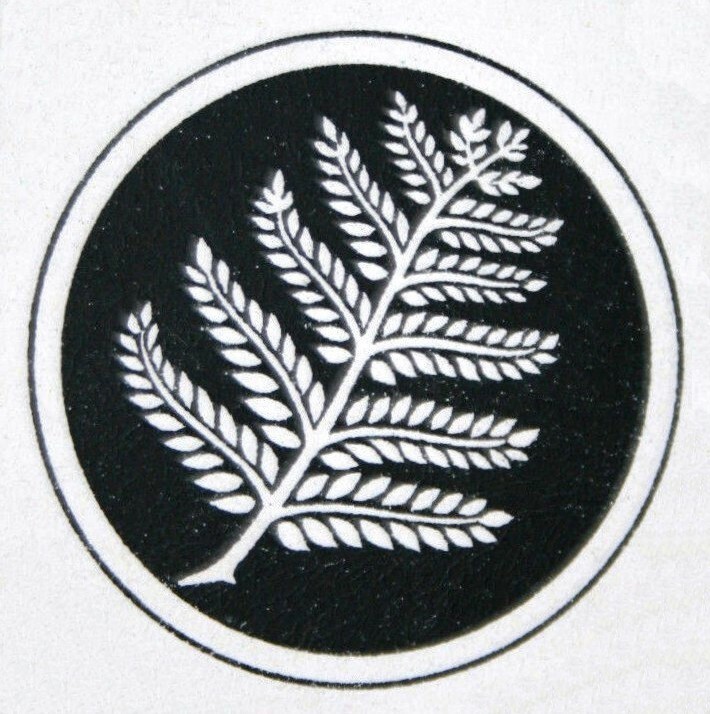 New Zealand Division Emblem : Silver Fern. Courtesy of Heather Anne Johnson. Above Left: New Zealand Remembrance Poppy (fabric). Above Right: New Zealand Te Papa Museum Remembrance Poppy (paper). 2016. Image courtesy/© of A.&P.H. New Zealand ‘Patriotic Call to Yarn’ Project knitted poppies. Image courtesy/© of A.&P.H. Above: Displays of crocheted poppies inside the entrance to St. Mary’s Anglican Cathedral, New Plymouth – created by the Flower Guild. 2015. Images courtesy/© of A. & P. H.
Above: Crocheted poppies framing the Roll of Honour, St. Mary’s Anglican Cathedral, New Plymouth. 2015. Images courtesy/© of A. 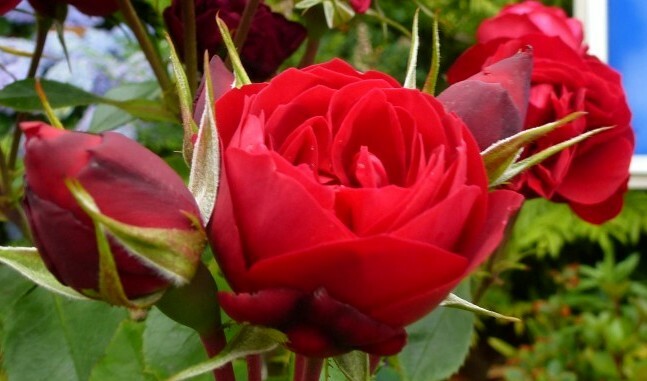 & P. H.
‘Gallipoli Centenary’ roses, growing at St. Mary’s Anglican Cathedral, New Plymouth, New Zealand. Image courtesy/© of A. & P. H.